The stop switch is used to shut down the wind generator if it is not to be operated or to prevent starting of the rotor when working on it. Wiring the stop switch is not obligatory if a charge regulator has been installed. 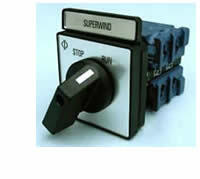 When using the Superwind on a boat or a sailing yacht, the stop switch is strongly recommended to shut the wind turbine down in heavy weather at sea. Spray and waves, parts detached from the rigg or from the sails etc. could touch the rotor. Furthermore in such situations the restricted mobility on board increases the risk of accidentially touching the running rotor. The positive line from the generator is connected to the battery. The negattive line from the generator is connected to the battery. The positive line and the negative line from the wind generator are short-circuited. The positive and the negative lines from the battery are both open and disconnected from the wind generator. The stop switch is designed for indoor panel mounting. 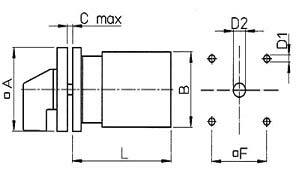 For easy adaption to panels of up to 22 mm thickness, the shaft is adjustable.